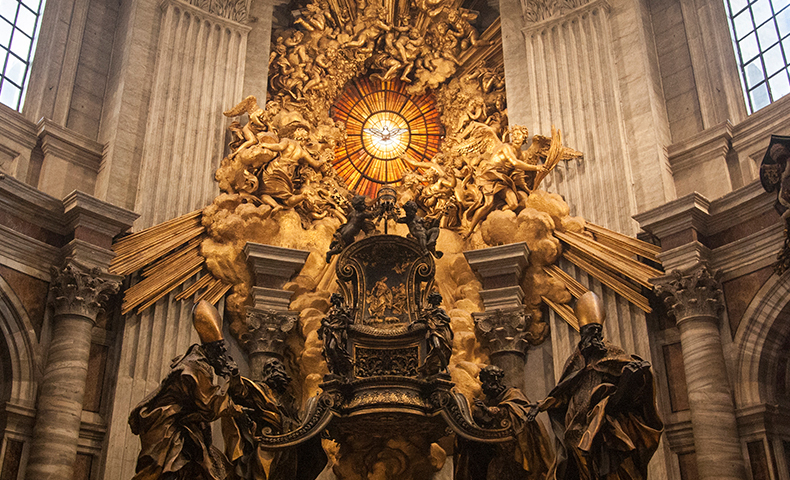 This feast commemorates Christ's choosing Peter to sit in his place as the servant-authority of the whole Church. After the "lost weekend" of pain, doubt, and self-torment, Peter hears the Good News. Angels at the tomb say to Magdalene, "The Lord has risen! Go, tell his disciples and Peter." John relates that when he and Peter ran to the tomb, the younger outraced the older, then waited for him. Peter entered, saw the wrappings on the ground, the headpiece rolled up in a place by itself. John saw and believed. But he adds a reminder:"... [T]hey did not yet understand the scripture that he had to rise from the dead" (John 20:9). They went home. There the slowly exploding, impossible idea became reality. Jesus appeared to them as they waited fearfully behind locked doors. "Peace be with you," he said (John 20:21b), and they rejoiced. The Pentecost event completed Peter's experience of the risen Christ."... [T]hey were all filled with the holy Spirit" (Acts 2:4a) and began to express themselves in foreign tongues and make bold proclamation as the Spirit prompted them. Only then can Peter fulfill the task Jesus had given him:"... [O]nce you have turned back, you must strengthen your brothers" (Luke 22:32). He at once becomes the spokesman for the Twelve about their experience of the Holy Spiritâ€”before the civil authorities who wished to quash their preaching, before the Council of Jerusalem, for the community in the problem of Ananias and Sapphira. He is the first to preach the Good News to the Gentiles. The healing power of Jesus in him is well attested: the raising of Tabitha from the dead, the cure of the crippled beggar. People carry the sick into the streets so that when Peter passed his shadow might fall on them. Even a saint experiences difficulty in Christian living. When Peter stopped eating with Gentile converts because he did not want to wound the sensibilities of Jewish Christians, Paul says, "... I opposed him to his face because he clearly was wrong... [T]hey were not on the right road in line with the truth of the gospel..." (Galatians 2:11b, 14a). At the end of John's Gospel, Jesus says to Peter, "Amen, amen, I say to you, when you were younger, you used to dress yourself and go where you wanted; but when you grow old, you will stretch out your hands, and someone else will dress you and lead you where you do not want to go" (John 21:18). What Jesus said indicated the sort of death by which Peter was to glorify God. On Vatican Hill, in Rome, during the reign of Nero, Peter did glorify his Lord with a martyr's death, probably in the company of many Christians. Second-century Christians built a small memorial over his burial spot. In the fourth century, the Emperor Constantine built a basilica, which was replaced in the 16th century. Like the committee chair, this chair refers to the occupant, not the furniture. Its first occupant stumbled a bit, denying Jesus three times and hesitating to welcome gentiles into the new Church. Some of its later occupants have also stumbled a bit, sometimes even failed scandalously. As individuals, we may sometimes think a particular pope has let us down. Still, the office endures as a sign of the long tradition we cherish and as a focus for the universal Church.